nanoFormula – factory producing nano protection. Products for home: transparent, self-cleansing, polishes useful in household to provide healthy home and excellent human environment.Car care: car body, car interior, car glass nanotecnology protective polishes to provide reliable car protect from external factors. Professional use: for cleaning companies, municipal structures, public transport companies, medicine centres, public places to reduce labor cost, saving money and reduce service time. Why products of nanoFormula Factory are better? Every hostess and homeowner tries the best to give a home a perfect look. The question is how it’s achieved and what means are used to complete this goal. Our company has developed recipes for easy cleaning, they saves a huge amount of time and decreases the amounts of harmful chemicals used in household. This is also concerning protective polishes and cleaners for car care. The same effects is present and let’s clean and take care of transportation vehicles in a eco-friendly and green way. not exclusive or elite in any way. Our aim is to lighten the amounts or harmful chemicals in cleaning in acceptable price level. Using them in households, cars and professional cleaning business is helpful and economically justified. All our products are made of organic polymer mixtures with inserted nano particles. Organic polymer is a liquid which stays intact for a long time (up to 10 years) if not being exposed to air. Mixture of polymers has excellent fluidity and can distribute itself to a surface by a very thin layer. We have made a mixture of polymers what obtains two the most important qualities. They are used in easy-cleaning products and have excellent adhesive properties (product stick to the surface very well). Layer forming on top of the surfaces is optically transparent and in many cases improves the looks and fixes defects by filling small cracks and scratches (for example on glass surfaces, plastics and painted surfaces). Nano components inside the products create continuous, invisible to eye layer of small particles. Included to polymers nano particles have the biggest covering area you can imagine and even on a small concentration of nano particles is enough to cover all applicable area completely. Polymer is not volatile and holds the nano components tight inside its structure. You cannot separate one from another- it guarantees that nano-sized particles do not get “loose” and incur to human organism and harm our health and surrounding environment. We think that this is one of the most important qualities, as this is not studied thoroughly yet. We pay attention to a small consumption of these easy-clean products. In average it is 3 grams per square meter. It is enough to wipe the surface with damped with products cloth; thereat the most of it (approximately 70%) stays on the cloth. Even if you decide to spray it directly to the surface in order to achieve better results, you still need to remove excesses. Surface covers effectively with the coverage of 1 gram per square meter; all other is taken away by cloth. nanoFormula cleaners for the waterless car wash are on the other hand used by spraying it directly to the surface. Consumption of these products is 25-35 grams per square meter (approximately one tablespoonful for one square meter). The exact consumption (25 grams per square meter) we are using to calculate differences between common household and car care cleaners and easy-clean products. Using any other household or car cleaning products gives only clean looks in a short period of time. Although the dirt is removed from the surface, the backward process begins almost immediately (dirt and pollution start to gather on the surface again), over a period it needs to be cleaned again with chemical cleaners. Products for easy cleaning, manufactured by nanoFormula factory, gives surfaces protection layer, which is water-, dirt- and grease repellent. It is also self-cleaning and do not allow dirt to adhere on surfaces. All the dirt is easily removed by cloth, moistened previously with water even when there is burned food on the hotplate or stove. For example, car what is previously washed clean with nanoFormula.Car.Cleaner.Universal, is easily cleaned again by damped with water cloth or washing with pressure washer without any chemicals. What to answer to this information? Indeed, the difference in prices is more than 5 times more expensive. Let’s do some simple mathematics. Let’s say that kitchen is cleaned every day. In such way, using easy-clean household care product is 7-8 times cheaper than using common “economy class” cleaner. We consider that the economical difference is not the main issue when using easy-cleaning products. It is more important how much we decrease the amount of chemicals used in our homes. (365 days / 14 days – protective layer effective working time) x 3 ml = 78 ml. In other words, consumption of harmful and not friendly to environment chemicals decreases for 116 times! It is better not to pour chemicals at all, it is best to environment and our health. We think everyone agrees with us on this. We consider that the biggest achievement in cleaning, as in household and in professional sphere. Finally, this amount of 9 liters “economy class” cleaning chemicals ends up in sewer and becomes potential threat to surrounding environment. Residues of nanoFormula factory easy-cleaning products are inert and solid polymers, which can be utilized as household garbage. Whole new nanoFormula factory web-page! Check it out! Website of nanoFormula Factory is renewed! Whole conseption is changed, it is now easier to find information about our easy-to-clean products for household and protective polishes and cleaners for cars! Our team attended high quality trade fair "Mobi 2011" in Krasnodar, Russia. We were surprised (in a good way of course) about the interest to our Car product line. Although it seems that nothing comes as a news to people of Krasnodar, many people showed up theitr interest and wished that we had a official representatives in that city. We managed to get some good business contacts and hope to start exporting to that wonderful and beautiful city in the Southern-Russia, Krasnodar. nanoFormula products are now available in E-shop! Please follow this link. There are all our products represented and many more to come. Welcome to our e-shop! We are pleased to inform about new product from „nanoFormula“ factory! We have developed new, waterless Eco-smart cleaner for using in frost-free season „Car.Cleaner Summer“. It efficiently removes all dirt, bug stains and bird droppings and is suitable for all interior and exterior parts of your car. Please see more information on our factory web page. This cleaner allows easily keep your car in perfect condition and reliably protects it. It is enough only spray, wipe and polish for an excellent results and long satisfaction. It enables to wash your car everywhere, it is quick and easy to do. 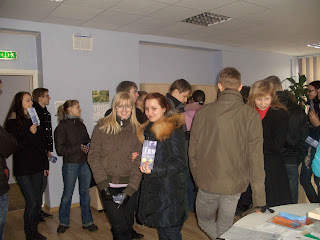 On the April 8 visited us student group from one of the biggest universities in Estonia, Tallinn Technical University. Student group took the tour in facilities of the factory and listened short introduction about the company history and manufacturing processes. Students in the packing room where nanoFormula product sets are packed. After the tour in the manufacturing facilities students gathered in office rooms where they got our product booklets and asked various questions about us and factory "nanoFormula". After finishing our tour, on behalf of all students Mihkel Annus, the leader of student group presented us thank you diploma. It is always good to host this kind of groups. All participants were extremely interested in our factory and the information they hear about the process. Factory nanoFormula always welcomes all other groups who are interested in nanotechnology and our work. Thank you for visiting us and welcome back! We proudly present You new blog about nanotech products manufacturer and factory "nanoFormula". We hope You like our products, as we made them with care and love and hope that they change Your life more comfortable and you have more free time because of them. Please feel free to visit our factory web-page. Welcome!